Artist Siri Hollander was born in New York in 1959 and lived most of her childhood in Andalusia, Spain. Influenced by a family of artists, she began sculpting at the age of seventeen. Seemingly isolated from normalcy, Siri established a connection with the horses and other animals that surrounded her in her youth. By apprenticing with several accomplished sculptors both in America and Spain, she developed her own sculptural form based on her unique subjects, horses and figurative forms. Hollander’s sculptural medium combines steel and cement creating her trademarked texture, which when cast in bronze bring her sculptures to life. The freestanding sculptures range from monumental to smaller tabletop works. With extraordinary focus and conviction, Hollander works independently of the trends in art movements. Her art flows naturally from her daily life, without dependence on outside factors. 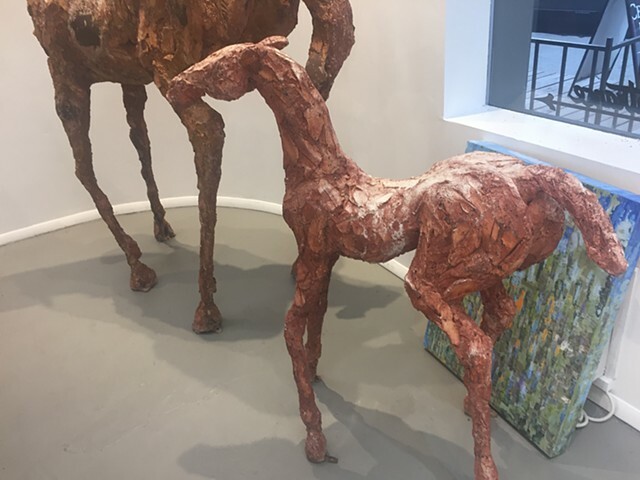 She has become a master of three-dimensional images of horses and more recently has developed her figure sculptures, greatly influenced by the emotional impression in the sculptures of modern masters. Hollander’s self-taught process constructs the sculptures with no sketches or maquettes, working directly with steel and recycled metal to combine realism and abstraction, emphasizing the rough essence of the subject. 2013 Dixion Library Rising Stallion Purchased by Dixion N.M.
2011 Frenchies Field Santa Fe N.M.
2010 Del Norte Vineyard Exposition 16 Horses Pojuague N.M.
2009 Bishops Lodge , Santa Fe N.M.
2004 Bill Gates ,Private Collection Redmond ,Washington. 2003 Hotel Santa Fe, Santa Fe N.M.
1995 Aspen Highlands ,Ritz Carlton Club, Public Placement, Aspen Colorado. 1994 The Downs At Santa Fe N.M.
1992 Downtown Aspen Hyman Mall Ave 20 year Installation City of Aspen Colorado. 1990 Group of 17 Life Size Horses Commissioned for New School of the Deaf Santa Fe N.M.
1990 Amara 6' Bronze Purchased for Louis Oddete Windsor Sculpture Garden,Windsor Canada. 1987 El Dorado Hotel ,Public Placement Santa Fe N.M.
1985 Apprentice for Anna Hanbury's Lioness and Phoenix Albuquerque Zoo Albuquerque N.M.
1979 Bronze Centerpiece Exhibit , Hotel Bobadilla , Granda Spain. 1976 20' Stallion Commissioned by Malaga International Airport.